Part of being a member in the National Honor Society is doing your part and helping out with service projects throughout the year. Last school year several students expressed an interest in wanting to help the school campus go green by getting a recycling program started. The President, Elizabeth Zhang, tried to contact different companies to see who would be willing to help us and figure out how to get started. Unfortunately, she did not have any luck. As a last ditch effort the sponsor, Ms. Brittney Fetter, contacted the Recycling Office of East Baton Rouge Parish to see if they had any ideas about how the club could get the recycling idea off the ground. Thankfully a glimmer of hope was sparked. Richanne Caraway at the Recycling Office guided the sponsor to a representative at the Department of Environmental Services (DES) in hopes that we would be able to enter the recycling competition with the other schools in the East Baton Rouge Parish School System. After discussing the idea with the DES representative Michael Lowe, the NHS club decided this was the service project for us this year. The club had an orientation meeting with Mr. Lowe so that he could explain the rules of the competition and get everyone on board. The students were excited about getting to make a difference in their school community. Later that week, Friday October 20, 2017, the recycling bins were delivered by Republic to aid the NHS in their mission. They received four bins to help collect the recycling, and the bins were placed in different areas around campus to make it easier for the students during collection. The competition started that very next Monday morning on October 23, 2017 and they had four weeks to collect as much as possible. They asked the faculty to place a recycling bin in their classroom, to aid in the collection process. The students and the teachers were very good at making sure that the appropriate material was getting recycled; paper, plastic, cardboard, no food waste. It was decided to pick-up twice a week during both lunch shifts on Wednesday and during the beginning of 4th block on Fridays. Students volunteered to go around and collect the recycling. Throughout the competition the club members had to keep track of how many bins were put into the recycling dumpster. With the help of the teachers, students, office staff, and the cafeteria staff the club was able to dump 111 bins of recycling. In the end it weighed over 5,000 pounds. It was amazing! Since the students met their goal of 100 carts, the whole school was able to participate in free dress for a whole week. The week after Thanksgiving break the sponsor was anxiously awaiting the news to find out who had won the whole competition. At the end of the day on November 27, 2017 the email finally came through; Congratulations to Woodlawn High School, the winner of the recycling competition! Being the winners of the competition, meant a visit from Mayor-President Sharon Weston Broome. The Mayor came to the school on Monday December 11, 2017 to announce Woodlawn as the winners and to declare that December 11, 2017 is Woodlawn High School Day. Even though the competition has ended, our goal to keep the campus green remains. 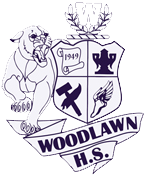 The National Honor Society appreciates all the help from everyone involved and hopes for the continued support from the Woodlawn High family.